Big news: The MacBook Pro models all received a speed boost and Core 2 Duo CPUs. Small news: Apple has finally released an airline power adapter for MagSafe 'Books. Bad news: You can't use the airline adapter in your terrestrial cigarette lighter plug. Good news: 3M is working on safer lithium-ion batteries. Apple on Tuesday announced that its entire MacBook Pro line of notebooks now includes the new Intel Core 2 Duo processor and delivers performance that is up to 39% faster than the previous generation. All MacBook Pro models now offer double the memory and greater storage capacity than the previous generation, as well as a FireWire 800 port for connecting to high-speed peripherals. The new MacBook Pro's stunning, lightweight, aluminum enclosure is just one-inch thin, available in 15" and 17" models, and features a built-in iSight video camera for video conferencing on-the-go. "With an Intel Core 2 Duo processor, greater storage capacity, and FireWire 800 connectivity, the new MacBook Pro delivers unprecedented performance and mobility in an incredibly thin and light design," said Philip Schiller, Apple's senior vice president of Worldwide Product Marketing. "We are thrilled that our notebook sales are growing twice as fast as the overall notebook market, and we hope these new MacBook Pro models continue that success." Every MacBook Pro features the new Intel Core 2 Duo processor with 4 MB of shared level 2 cache, which is up to 39% faster than the previous 2.16 GHz MacBook Pro and more than seven times faster than the 1.67 GHz PowerBook G4 running industry standard benchmarks. * Apple has enhanced Mac OS X to take advantage of the technology advances from Intel's Core 2 Duo processors, resulting in increased performance in professional applications like Aperture 1.5, Final Cut Pro 5 and Logic Pro 7. Ideal for business and creative professionals, MacBook Pro delivers advanced performance including 667 MHz DDR2 SDRAM memory expandable up to 3 GB, ATI Mobility Radeon X1600 graphics with up to 256 MB of dedicated GDDR3 graphics memory, and a double-layer SuperDrive for burning professional-quality DVDs. With the latest high-performance connectivity options, every new MacBook Pro includes built-in 10/100/1000 Base-T gigabit ethernet for high-speed networking, built-in AirPort Extreme and Bluetooth 2.0+EDR (Enhanced Data Rate), a FireWire 800 and a FireWire 400 port, combination analog and optical digital audio input and output ports, an ExpressCard/34 expansion card slot, and a DVI video output to connect up to a 30" Apple Cinema HD Display. MacBook Pro comes with Apple's MagSafe Power Adapter that magnetically couples the power cord to the MacBook Pro and safely disconnects when there is strain on the power cord, preventing the notebook from falling off its work surface. Apple now offers a new MagSafe Airline Adapter that makes using the MacBook Pro on an airplane even more convenient by connecting to in-seat power ports for continued productivity throughout the duration of a flight. MacBook Pro also includes an illuminated keyboard, Apple's Sudden Motion Sensor that is designed to protect the hard drive in case of a fall, and a Scrolling TrackPad to easily scroll through long web pages or pan across large photographs. MacBook Pro comes with iLife '06, the next generation of Apple's award-winning suite of digital lifestyle applications featuring iPhoto®, iMovie® HD, iDVD, GarageBand and iWeb, the latest iLife application that makes it super-easy to create amazing websites with photos, blogs and podcasts and publish them on .mac for viewing by anyone on the Internet with just a single click. ** Every MacBook Pro also comes with the latest release of the world's most advanced operating system, Mac OS X version 10.4.8 Tiger including Safari, Mail, iCal, iChat AV, Front Row and Photo Booth, running natively on the Intel-based notebook. The new 15" MacBook Pro is shipping today, the new 17" MacBook Pro will ship next week, and every model will be available through the Apple Store, Apple's retail stores, and Apple Authorized Resellers. The Apple MagSafe Airline Adaptor is shipping today for a suggested retail price of $59. Additional build-to-order options for the MacBook Pro include the ability to upgrade to a 200 GB (4200 rpm) or a 160 GB (5400 rpm) hard drive, up to 3 GB DDR2 SDRAM, Apple MagSafe Airline Adapter, Apple USB Modem, glossy widescreen display, and the AppleCare Protection Plan. "After seeing how well equipped the updated MacBook Pros are I decided to go and compare them to comparable Dell machines. To my pleasant surprise the Macs are substantially cheaper. "I took a quick look at the Dell store and found the Dell Precision line to be closest to the MacBook Pro line. It is their high-end line of notebooks. I started out with the basic 15.4 inch model and upgraded the Dell to match the standard features the MacBook Pro has. For the most part they are identical, there are a few differences though. First of all, I didn't upgrade the Dell's screen. I'm guessing an upgraded screen would be closer to Apple's but I wanted to give Dell the best chance possible to beat Apple (so that people won't try to claim I'm just trying to make Apple look good). The next difference confused me. The MacBook Pro had a 128 MB video card. The Dell has a 256 MB card and can use 256 MB of shared system memory for a total of 512 MB. I'm not an expert on video cards but we'll call Dell the winner. The final difference is that the Dell does not have a DVD burner. I could have added one but the MacBook Pro is 6x and all I could find for the Dell was 8x so I left it with a CD burner. "Final Price - Apple: $1,999 Dell: $2,874"
"Apple released a significant update to the MacBook Pro yesterday adding a new Core 2 Duo T-series processor to the mix. Let's take a look at what's changed. "Apple has upgraded the MacBook Pro to the latest Intel silicon and the Core 2 Duo chip features a 64-bit architecture. Unfortunately, Mac OS 10.4 is only a 32-bit OS. The good news is that Apple has promised that Mac OS 10.5 (Leopard) and most of their software will be 64-bit aware by the time Leopard is released in the Spring of 2007. "The other significant bump in the Core 2 Duo processor is that it ships with 4 MB of Level 2 cache, double the L2 cache in the previous MacBook Pro. That alone should add a noticeable performance jump in the new MacBook Pro." "Apple's iMac desktops made the transition to the Core 2 Duos last month, a move that left Apple fanatics wondering - What about a Core 2 Duo MacBook and MacBook Pro? You have to love how Mr. Jobs keeps people on their heels. Today, the Apple core gets the official refresh, upgrading the MacBook Pros to the Intel Core 2 Duo, but not the MacBooks. The move comes right after reporting terrific 3rd-quarter earnings and is timed perfectly for the holiday season." "New electrodes and electrolytes could mean higher energy and less danger from lithium-ion batteries. "By the end of next year, engineers at 3M, based in St. Paul, MN, expect to have ready for battery makers new materials and manufacturing methods that will add 30 percent more capacity to lithium-ion batteries. These new methods will also address safety concerns surrounding the use of such batteries in laptops." "Never plug the MagSafe Airline Adapter, with or without the 20 mm adapter or third-party adapter, into an automobile's cigarette lighter or auxiliary power socket. Using the MagSafe Airline Adapter in a car won't provide power to the computer or charge the battery." PR: ShaggyMac Announces OptiMist Prime, a laptop spray cleaner. There are many public misconceptions concerning what should be used to clean a laptop screen. Some people use household cleaners and paper towels, while others use different types of alcohol sprays to get the job done. The aforementioned cleaners have the potential to permanently damage the sensitive surface of a laptop screen and are not recommended by professionals. ShaggyMac OptiMist Prime is an advanced, molecular level cleaner, specifically engineered to clean the most sensitive optical surfaces. OptiMist Prime is compatible with any laptop screen, matte or glossy. It also safely cleans LCD screens, plasma TVs, camera optics, iPods, and more. Originally used in the Aerospace Industry, OptiMist Prime excels at safely purifying all optical surfaces. OptiMist Prime is a clear aqueous formula, which does not contain alcohol, detergents, vinegar, dyes, ammonias, acids, phosphates, polymers, chlorides or caustics. The 5 oz spray bottle retails for $8.95 and is sufficient for hundreds of applications. ShaggyMac recommends using OptiMist Prime™ in conjunction with their TrueMicro polishing cloths. It is also distributed at a wholesale level, contact ShaggyMac for details. PR: The reality of the mobile office is often experienced while precariously balancing a laptop inside a rented midsize. This is not the mobile office dream that technology has promised. Rissler Research and Development (RR&D) has developed the Mobile Office Extension (MOE) to help make the reality a little friendlier. 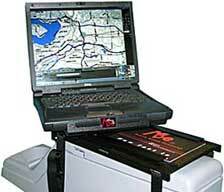 The MOE securely mounts a laptop or other electronics into a vehicle, while still being easily removable. Many companies and professionals rely on leased or personal vehicles; and most leasing plans do not allow installation and mounting of hardware. The MOE eliminates such problems by installing and removing without hardware and the need for tools. The MOE quickly transports between vehicles and stows easily in a laptop bag. The modern vehicle is expected to do more than provide basic transportation; we now expect to be helped to our destination and entertained along the way. The MOE and laptop combination can bring all the functionality of your office workstation, while having the added benefit of adding GPS / entertainment systems to almost any vehicle. The MOE can also be used as a lap-table while on a plane, van , carpool and provide a stable and insulated work surface. The MOE can be an integrated tool for almost any professional today. Many professions now rely on laptops while away from the office. RR&D is focused on improving the ergonomics that the current mobile office operates with. The MOE is designed to help make time in the car as productive and efficient as possible. 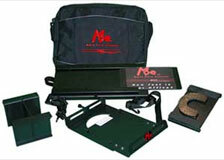 The MOE consists of a cradle that securely holds a laptop and a base-plate that attaches to the interior of a vehicle. The base-plate allows for a very flexible attachment system that accommodates a multitude of vehicle layouts while being easily removable. The cradle is configurable for most common laptop brands with screens ranging from 12 to 21 inches. Provisions allow for the use of standard security cables to prevent theft or the cradle/laptop combo is easily removed from the vehicle as a unit. Various accessories allow for height and offset adjustment that can be used to suit almost any preference or position. The MOE disassembles easily and stores flat pack style within the size of a standard laptop carrying case. Travel and ease of airline check-in was a major consideration. The MOE can be carried easily in travel luggage and all of the components are built of nonmetallic materials. Many other electronics are suitable for mounting with the MOE besides laptops. Additional products include a multiple laptop extension, portable printer enclosure, writing desk insert, utility/storage box, sun/glare/privacy screen, and a screen stabilizer bar. The MOE has been adopted as an important tool for jobs that range from sales to life saving. The MOE is a portable and compact solution to your mobile office needs . 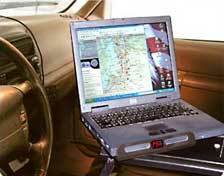 Anyone can now mount a Laptop, DVD player and Multimedia/ Gaming device in a vehicle. 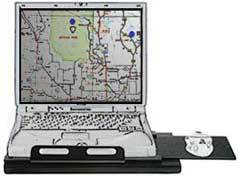 Securely locates laptops, DVD players and Multimedia/ gaming devices. Setup and transfer to additional vehicles is easy and convenient . The MOE series of products are intended to fit most any vehicle that has any of the following( Console, Armrest, Open seat). Installation is relatively painless. First time setup ( includes sizing for the individual device)may take 10-15 minutes. subsequent installs may take only 5-10 minutes. Units are primarily constructed of ABS plastics. ABS is used extensively in automobile components due to its ability to survive a broad range of environments , relatively light weight and is difficult to break under normal usage. Nor will it cause damage to the interior of vehicles. Also it is much easier to transport through airlines, since it will not cause delays as a metal version might. The MOE series of products are warranted against manufacturing defects. Such defects should be apparent within initial usage. we offer 30 days return for defects or repair. nova media has unveiled launch2net version 1.4.9 with support of the Novatel Merlin XU870 wireless ExpressCard modem. This ExpressCard allows mobile Internet connections with up to 3.6 Mbit/s in all HSPDA networks around the world as well as 3G UMTS, EDGE and GPRS connections. "MacBook Pro users can finally use a wireless HSDPA ExpressCard modem", states Jan Fuellemann, PR spokesperson at nova media. "It is the most convenient way to establish a mobile Internet connection and MacBook Pro users are not left in the dark any more." launch2net is available today for 75€ plus VAT at the company's website. The update to version 1.4.9 is free for current owners of a valid launch2net license. Some MacBook (Pro) are just too hot for day-long use. Fan Control adjusts the minimum fan speed depending on the current CPU temperature. For safety, it leaves the original automatic fan speed control intact. PR: DyCPU is a simple utility that helps you dynamically switch on or off your second CPU core in your dual core MacBooks or MacBook Pros. DyCPU is a simple utility that helps you dynamically switch on or off your second CPU core in your dual core MacBooks or MacBook Pros. DyCPU provides 3 main values for adjusting when the second core of your machine will be turned on or off. Gauge: This defines the time period that will be used to compute the load of the system. Threshold: This defines at what load level will the second CPU be turned on. CheckInterval: This defines the time interval that DyCPU will check the load average value. If Gauge is set at "Five", this means that DyCPU will be using five minute load averages as the checking measure. The value read at the moment in time, will be compared to the threshold. Note that each CPU is capable of a load index of 1 (i.e. 100%). If the actual load is below the threshold, the second CPU will be switched/kept OFF. However, if the actual load is higher than the threshold value, the second CPU will be triggered on automatically. Once the actual load is checked, DyCPU will sleep for CheckInterval number of seconds before the next check on the system. Setting the threshold value to 0 will keep both CPUs on all the time. Setting the threshold value to the number of CPUs that you have will keep only one CPU turned on. You typically do not need to restart DyCPU after making changes in the Preferences Pane. DyCPU will pick up the new settings automatically at the next Check interval. However, if you wish to do so, click on the Restart button to apply the settings immediately. PR: The QuickerTek Connect product is a true wireless antenna with exceptional power and now the included setup software version 1.5 is completely automated so that anyone can set it up. The Connect is a wireless super-antenna that does not require opening the computer case for installation. Connect is designed to work with the MacBook Pro, MacBook, PowerBook, and iBook models. The Connect is the first wireless antenna that anyone can install and setup and have the benefit of 200 milliwatts of wireless RF power. Most current portable Macs have less than 50 milliwatts of RF power and the Connect boosts the wireless distance, signal strength and wireless speed with up to four times the RF power. Using the new version 1.5 software, the initial setup is now completely automated, so that the product is as easy to setup and use as the Mac itself. With the introduction of the new Core 2 Duo MacBook Pros this week, prices on refurbished Core Duo models have been reduced.